It's a grey old day today. I think it might be raining. Well it looks like it is from my little office window at any rate. 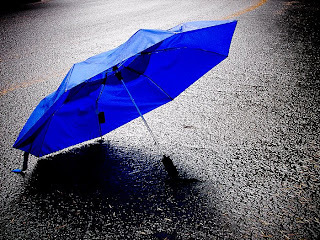 I'm a bit of an oddity in that I love rain. Well, only in certain situations. Festivals. Glastonbury in particular. Now, as anyone who knows me will tell you, I loves me a good festival. I've been to lots of different ones, of all shapes and sizes. Little, large, good, bad. But Glastonbury is the ultimate for me. I've been 5 times (this year will be my sixth) and I adore it like nothing else (well, nothing else but cheese. And wine). But rain has the power to dampen my spirits, even at Glastonbury. 2006 was a particularly dark year for me. Torrential rain day and night. No let up. Nowhere to sit. 14 hour days spent trudging endlessly round in an ever-increasing mud soup. Vile. When I've straightened my hair. I admit it, I'm a bit of a girl when it comes to my hair. It's so long and has a horrific tendency to frizz up like a puffball when it comes into contact with even the merest hint of moisture. When I'm off on a night out. High heels and I don't get on at the best of times but throw a bit of precipitation into the mix and I'm slipping all over the show in no time. Not good. At all other times, however, I'm a big fan of the wet stuff. Particularly when I'm sitting indoors listening to it pelting down against the windows. Give me a cosy fire and a bottle of nice red and that's pretty much heaven to me. In other news, my boyfriend is a marvellous cook. Like, really really good. Last Sunday, for example, he made me a rather cheeky baked herbed salmon with caramelised lemons. Yum. I didn't get a photo of it but, rest assured, it was very very tasty. I've even told him before that he should think about going on Masterchef. His Falafels are the best I've ever tasted (and that's not even a euphemism). So you can imagine my delight when he announced that he was making dessert and snuck off to the kitchen last night. 'What can my very own little chef have made for me?' I wondered, in quivering anticipation. 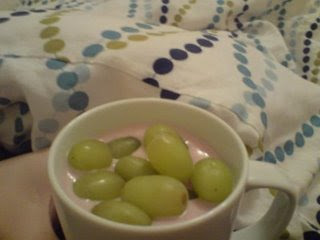 Yes my friends, that is grapes and yoghurt in a mug. I bet you're glad I had a camera to capture this culinary triumph, aren't you?